Place 1 agenda counter on Armored Servers when you score it. 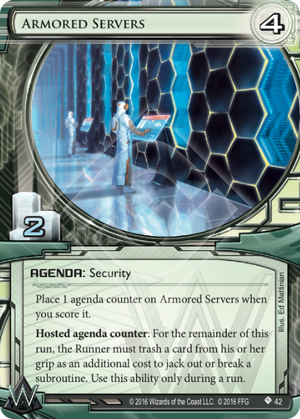 Hosted agenda counter: For the remainder of this run, the Runner must trash a card from his or her grip as an additional cost to jack out or break a subroutine. Use this ability only during a run. Can the Corp use more than one Armored Servers during a run? Yes. Both add an additional cost to jacking out or breaking subroutines, so the Runner would have to trash 2 cards from their grip whenever they wish to do one of those two things. If the Runner wants use an ability that breaks multiple subroutines, must they trash a card from their grip for each subroutine that ability would break? If the Runner wants use an ability that breaks multiple subroutines, but declines to pay the additional cost from Armored Servers for some of the subroutines, what happens? The Runner breaks the subroutines for which they paid the additional cost, and does not break the subroutines for which they didn’t. So, you're saying that if I have more subroutines than the runner has cards, they can't get in? And that if they happen to come across an ice with a nasty face-check with a large number of subroutines, they will need to spend their hand to deal with it? And that if they have no cards in hand they can't just jack out to get out? Komainu is only 4 influence a piece, and with Mausolus,Cobra, and Prisec all being good cards that also happen to do damage, it's entirely possible to set up a kill server for the runner to fall into with this. And if you are playing this in Titan Transnational, you get a free bonus counter, as well as influence to pay for a couple copies of Friends in High Places to help you get your ice the right way around. Anyway, enough combo theorisation, the best comparison here is that it's the Weyland version of Nisei MK II, if popped at the start of a run on your scoring server, it's quite likely the runner won't be able to get in, but they can reasonably bounce off an ETR ice, and run again. So, clearly, it's best if you pop it as the runner approaches an ice with a punishing face-check, as then they are forced to break it, paying the cards, pay the card to jack out, and then run again, at which point it might not be practical for them to run again. But them running again is still quite feasible, so clearly, you need to make use of the 3-4 cards the runner will have spent on the first run to make it worth it, be it another counter from Titan, or a Snare!, or even just making use of the runner having used up another click, potentially leaving them tagged, and probably without the cards to survive a Scorched Earth. This agenda seems entirely playable, though it does require some deck-building decisions to really make it worth it outside of Titan, I can see it getting played in Titan once Weyland's other problems compared to other factions are addressed. One thing i never see talked about with this card is using the token when the runner plays a high impact run event like account siphon. They won't just ETR and come back in because their event is wasted.